Premium high-end watches from brands such as Rolex, Cartier, Maurice Lacroix and TAG Heuer have been respected and revered for generations. In today’s fast-paced digital world with smart phones and tablets offering up-to-the-second timers and stop watch functions, luxury Swiss-Made wristwatches still hold prominence and prestige. While men’s and women’s fashion watches are extremely popular today and take-up a big portion of the timepiece market share, premium high-end watches do hold their value better and are considered a good financial investment. First and foremost, nothing compares to expert bespoke craftsmanship of these timepieces, nor the intricate mechanical, automatic and quartz movements inside. To paraphrase the advertisement of a popular watchmaker, consider it an investment you’ll be handing down to your children and they will be handing down to their children. For generations Rolex watches have been considered the timepieces of royalty, presidents and dignitaries. The brand is originally of British descent, founded in London, England in 1908 by entrepreneurs Hans Wilsdorf and Alfred Davis. Wilsdorf and Davis originally started in the watch business a few years earlier, importing premium Swiss movements and housing them in quality watches cases that were sold to jewelers, who put their own names on the dials. At the formation of the new brand, Wilsdorf and Davis opened a production plant in Switzerland, while maintaining a corporate office in England. The brand later moved their corporate offices to Switzerland in 1918. Rolex remains the pre-eminent Swiss watchmaker in the world today. Their state-of-art craftsmanship and classic yet innovative designs have made them one of the most sough- after watch brands around. What’s more, most Rolex watches hold their value better brands. You’ll find an impressive collection of Pre-owned Rolex watches at luxury retailer TheWatchery.com. Each pre-owned watch is expertly restored with original manufacturer parts and passes a comprehensive 30-point inspection. 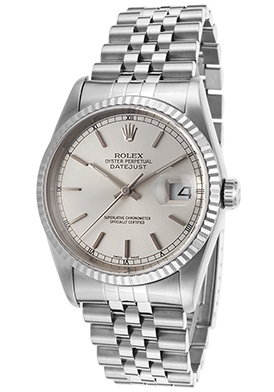 The Rolex Datejust Automatic Men’s watch is an excellent choice. This outstanding automatic men’s timepiece is a certified chronograph, a certification of precision awarded by the COSC (Official Swiss Chronometer Testing Institute). The premium grade stainless steel case is presented on the signature Jubilee five-link bracelet in premium grade steel. The stationary, highly polished Rotable ring command bezel in 18K white gold surrounds the silver colored dial with luminous sword hands and baton hour markers. A cyclops date window at the 3 o’clock hour reveals the automatic date calendar. A screw-down crown provides water-resistance up to 100 meters or 330 feet. Timepiece is 36mm in diameter and 12mm thick. Complementary delivery and extended holiday returns are included on all domestic US purchases at TheWatchery.com.